Pens drop a heart breaker of a Game 7… Lightning advances with 1-0 win. 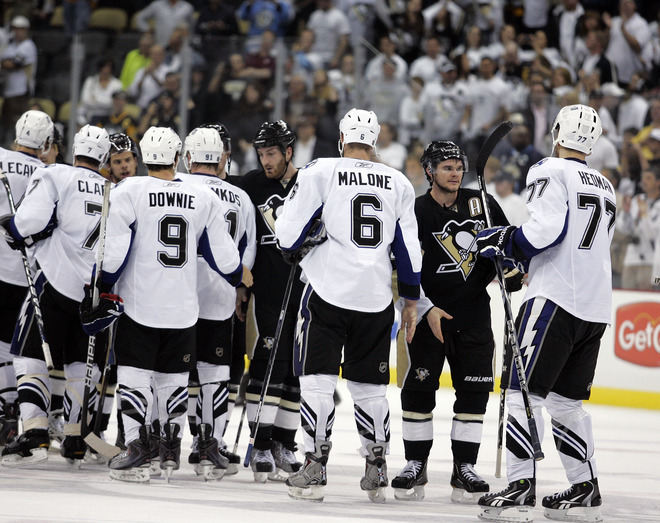 This is probably my least favorite day of the year – the end of the Penguins’ season. The bad thing is that win or lose, the season always ends. Having it end in April after the team watches a 3-1 series advantage evaporate makes it even harder. Sure the Penguins have a ton of very valid reasons why they should be going home in April, but for some reason that just doesn’t make it any less unbelievable. I mean, this team, without Sidney Crosby and Evgeni Malkin for the entire second half managed to put together their second best season in franchise history. They finished tied for the third best record in the league and looked like they were capable of an awful lot more than a first round exist. There are a ton of reasons why they are heading home for the year and I am sure we will discuss them moving forward… heck, we are going to have to fill the pages of this fine website with something over the next 8 or 10 weeks… but tonight I will just hit you with five things that made the night sort of special. 2 – The Penguins Faithful : the fans in this building this evening need to be commended. They were louder than I had ever heard them before. This place was absolutely shaking when the Penguins hit the ice. I realize that some folks have bashed the new barn for being a bit quiet and for not yet feeling like home… it felt just fine to me tonight. In fact a number of my press cronies and I commented on how it was downright chill inducing. You done good Pittsburgh… get ready for next year when the band comes back together. 3 – Marc Andre Fleury flipping off the critics: Ok, maybe he didn’t actually extend that French Canadian middle finger of his, but his performance this evening certainly looked like an F U to the folks that were starting to tear him apart. This kid could finish his career with hundreds of wins and several Stanley Cups and people will beat him up about not winning big games… well, tonight… he won in my book. His team let him down. He made more than a few “10 bell saves” and this season as a whole gives me high hopes for what he is going to be able to do moving forward with a healthy 87, 71 and company. 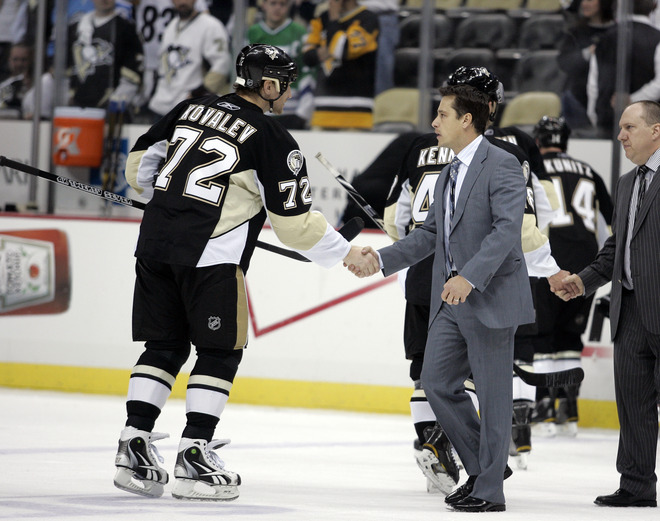 4 – Seeing Kovy in a Pens jersey one last time: We know that he didn’t have a great series. He was credited with 5 turnovers in tonight’s game. He looked every bit the enigma that we all know him to be, but it was great to see him get one more look in Black and Vegas Gold. I will talk more about him as we wrap the season up, but there are a couple of thoughts that I need to get out there before we ship him out the door. (Since re-signing him is doubtful) How on earth do you not put him out there when you are working a 6 on 4 power play late in the game? I realize that he didn’t have a great night, but the guy was probably the most skilled player on the team, especially in that situation. He has lived and died on the power play before and when you have a chance to tie up a Game 7 your most dangerous power play players should have been out there. As a well known media member just shouted out beside me minutes ago: “You just don’t send messages to a guy during the waning moments of Game 7 in which you are losing! Not having Kovalev on the ice was just absurd.” I agree… I am fine with the five-on-five benching, but I think Dan Bylsma made a mistake not playing him there… thoughts? 5 – Heart and Soul: if there is one thing that makes this loss different than last years, it is that this team looks to have a ton more heart. They went out there tonight knowing that it was all on the line and they left everything that they had left on the ice. Yes the power play sucked it up again, but the Mike Rupps, Max Talbots, Arron Ashams, and yes… James Neals of the world worked their tails off. They worked in tandem with the Brooks Orpiks, Zbynek Michaleks and Kris Letangs to put together a gritty defensive performance, probably the best I have seen out of them in three weeks. Unfortunately it wasn’t enough on this night…they couldn’t penetrate Dwayne Roloson… Though there will be a ton of tough decisions to make in the off season, I am feeling pretty froggy about grafting a Crosby and a Malkin back onto this team next year. The sky is the limit… what do you all think?? This was a bit of a transition year for myself and the website… we may go through some changes in the off-season, but we will be here bringing you all of the Pens and NHL news, info and analysis! Thank you all for the support! Keep it here for a ton of season wrap-up, final media availability coverage (Fri) and coverage of the rest of the NHL playoffs! More later… including post game audio, quotes and notes, etc. I agree with your comments Brian. After i dry away the tears for this unnecessary loss after an extraordinary season, i find myself angry at Bylsma – he should have added a couple of new players into the lineup for “fresh blood”; i feel he was out-coached in this last game. 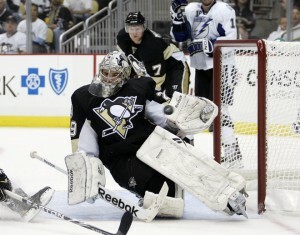 But, in general, he did a great job and the Penguins were fantastic in their work ethic, heart and willingness to try their best. I suspect many of players, including Kovy, were injured. I also believe that the Pens started losing this series when they found out, halfway through the series, that Sid wouldn’t be back ( i suspect that happened after 3rd game). But we learned so much about the depth of the team and i love what i saw this season – next year augurs well (if Sid can come back).